The new imperial era will begin on May 1. Emperor Akihito will be called “emperor emeritus” and Empress Michiko “empress emerita” following his abdication in April. Prince Akishino, Crown Prince Naruhito's younger brother, will be the next crown prince. A series of the ceremonies for the Imperial succession started on March 12. Most of them are simple and are not open to the public. In 2019 travelers should be careful about the holidays that will last from April 28(27) to May 6. The Emperor wearing ancient attire for emperors reads out a script to report his abdication and its date at Kashikodokoro(賢所), Koreiden(皇霊殿) and Shinden(神殿) on Imperial Palace grounds. Imperial ancestor Amaterasu-omikami(the sun goddess) is enshrined in Kashikodokoro(賢所). Successive emperors and members of the imperial family are enshrined in Koreiden(皇霊殿). Eight guardian gods of emperors and gods in heaven and earth are enshrined at Shinden(神殿). The Emperor sends Imperial envoys for reporting his abdication and its date, and making offerings to the Ise Grand Shrine and the Mausolea of Emperor Jinmu and the 4 recent Emperors up to Emperor Showa. The Mausolea of Emperor Komei and Emperor Meiji are located in Kyoto City, Kyoto Prefecture. Those of Emperor Taisho and Emperor Showa(Hirohito) are located in Hachioji City, Tokyo Prefecture. The Imperial envoy reports the abdication and its date, and made offerings at the Ise Grand Shrine. The Imperial envoys report the abdication and its date, and made offerings at the Mausolea of Emperor Jinmu and the 4 recent Emperors up to Emperor Showa. The Emperor pays reverence at the Mausoleum of Emperor Jinmu, Kashihara City, Nara Prefecture. The Emperor pays reverence at the Ise Grand Shrine, Ise City, Mie Prefecture. The Emperor pays reverence at the Mausoleum of Emperor Showa, Hachioji City, Tokyo. The Emperor reports the conduct of the Abdication Ceremony at Kashikodokoro, Koreiden and Shinden in Imperial Palace. Attendants gather at the Matsu no Ma (main hall) of the Imperial Palace. At 5:00 pm, the imperial couple enter the hall. They are accompanied by the crown prince and the crown princess, imperial princes and princesses(their wives), imperial princesses, great-granddaughters of Emperor Taisho. Chamberlains place the sword and the jewel of the Three Imperial Regalia, the Great seal and the Imperial seal on a table in front of the emperor. Prime Minister Shinzo Abe gives a speech on behalf of the Japanese people. The emperor gives a farewell address. About 338 attendants of the ceremony include the prime minister, cabinet ministers, speakers and vice‐speakers from both houses of the Diet, the chief justice of Supreme Court of Japan, prefectural governors. After the couple make their exit, the attendants make their exit. The ceremony lasts for 10 minutes from 5:00 pm. 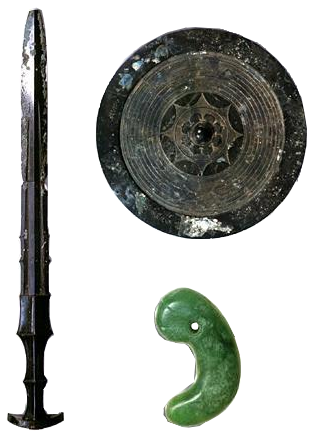 The Three Imperial Regalia consist of the sword Kusanagi (草薙劍), the mirror Yata no Kagami (八咫鏡), and the jewel Yasakani no Magatama (八尺瓊勾玉). Magatama are curved, comma-shaped beads. The oldest magatama were excavated from ruins of the Jomon Period(c.14,000- 300BCE). The beads were popular in the tumulus period(300-538). Yata no Kagami is a bronze mirror with one side polished bright, to give a reflection, and the reverse side with designs. It is thought that the three regalia became used to confer legitimacy on their owner as an emperor around 9th century. The real sacred mirror is enshrined as an object symbolizing the goddess Amaterasu Omikami at the Ise Grand Shrine, Ise City, Mie Prefecture. Its replica is enshrined at Kashikodokoro of Imperial Palace. The real Kusanagi sword is placed at Atsuta Jingu Shrine in Nagoya City, Aichi Prefecture. Its replica and the jewel (it's real) are stored in a room of Imperial palace. The sword's replica was made during the reign of Emperor Sujin, who is said to have lived in the early 1st century, or the third or fourth century. In the Nihonshoki(Chronicles of Japan), the real Kusanagi was moved from the Imperial palace to the Ise Grand Shrine. Later it was transferred to the Atsuta Shrine. Though the replica remained in the Imperial palace, it sank to the sea floor in 1185 when the Taira clan were defeated by the Minamoto clan at the Battle of Dan-no-ura. The sword and the jewel sank with many Taira clan members including the eight year-old Emperor Antoku. The jewel was recovered, but the sword was lost. Another sword was sent from the Ise Grand Shrine to the Imperial palace, and the sword became the replica of Kusanagi sword. However, no one (even emperor) can see the real regalia and the replicas. Ceremony to report the accession to the throne at Kashikodokoro in Imperial Palace(ritual prayer by a proxy). Ceremony to report the accession to the throne at Koreiden and Shinden in Imperial Palace(ritual prayer by a proxy). Attendants of the ceremony including cabinet ministers, the heads of the three branches of government gather at the the Matsu-no-Ma hall of the Imperial Palace. At 10:30 am, the new emperor enters the hall. He is accompanied by the crown prince and adult imperial princes. Chamberlains place the sword and the jewel of the Three Imperial Regalia, the Great seal and the Imperial seal on a table in front of the new emperor. The new emperor makes his exit. Chamberlains carry the regalia and the seals out of the hall. The attendants make their exit. The ceremony lasts for 10 minutes from 10:30 am. Attendants of the ceremony gather at the the Matsu-no-Ma hall of the Imperial Palace. At 11:10 am, the new imperial couple enter the hall. They are accompanied by the crown prince and the crown princess, imperial princes and princesses(their wives), imperial princesses, and great-granddaughters of Emperor Taisho. The new emperor make an address. Prime Minister Shinzo Abe gives a speech on behalf of the Japanese people. The new imperial couple make their exit. The attendants make their exit. The ceremony lasts for 10 minutes from 11:10 am. The new emperor receives congratulations from the general public after the Enthronement Ceremony at the Imperial Palace. No reservations are necessary, but visitors need to allow enough time to go through security check. The new emperor reports the dates of the Enthronement Ceremony and Daijosai (Great Thanksgiving Ceremony) at Kashikodokoro in Imperial Palace. The new emperor reports the dates of the Enthronement Ceremony and Daijosai (Great Thanksgiving Ceremony) at Koreiden and Shinden in Imperial Palace. Ceremony to send Imperial envoys for reporting the dates of the Enthronement Ceremony and Daijosai (Great Thanksgiving Ceremony), and making offerings to the Ise Grand Shrine and the Mausolea of Emperor Jinmu and the 4 recent Emperors up to Emperor Showa. The Imperial envoy reports the dates of the Enthronement Ceremony and Daijosai (GreatThanksgiving Ceremony), and makes offerings at the Ise Grand Shrine. The Imperial envoys report the dates of the Enthronement Ceremony and Daijosai (GreatThanksgiving Ceremony), and make offerings at the Mausolea of Emperor Jinmu and the 4 recent Emperors up to Emperor Showa. The Emperor reports the conduct of the Enthronement Ceremony at Kashikodokoro. The Emperor reports the conduct of the Enthronement Ceremony at Koreiden and Shinden. The new emperor proclaims his enthronement and receives felicitations of representatives from home and abroad. About 2,500 guests are invited to attend the ceremony, including heads of states and their spouses, congratulatory envoys and their spouses, ambassadors to Japan, representatives of Japanese descendants from 195 countries. A celebration parade moves from the Imperial Palace to the Akasaka Imperial Residence. The imperial couple get in a convertible, the crown prince does in another car. About 110,000 people lined motorcade route to cheer at the last coronation parade in 1990. Court banquet to celebrate the enthronement of the Emperor and for him to receive the congratulations of the guests in the Imperial Palace. Sit-down dinners are held on October 22 and 25, stand-up ones are done on October 29 and 31. About 2,600 guests are invited to attend the banquet, including heads of states and their spouses, congratulatory envoys and their spouses, ambassadors to Japan and their spouses, representatives of Japanese descendants. About 900 guests are invited to attend the dinner, including heads of states and their spouses, congratulatory envoys and their spouses, two representatives of each country, representatives of Japanese descendants. Daijosai is a Niinamesai that a new emperor holds for the first time after his enthronement. Annual Niinamesai is a harvest festival held at Shinkaden in Imperial Palace on November 23rd. The festival dates back at least to 677. Daijosai takes place at a temporary site. This year's site is East Gardens on Imperial Palace Grounds. The new emperor dedicates newly harvested rice to imperial ancestors and gods in heaven and earth for the first time after his enthronement, and he partakes of the rice. The rites related to Daijosai are held on May 13, November 8, 12, 13,14,16, 18. The dates of five rites are to be determined. The Emperor pays reverence at the inner and outer shrine of the Ise Grand Shrine after the Enthronement Ceremony and Daijosai (GreatThanksgiving Ceremony). The Emperor pays reverence at the Imperial mausoleums of Emperor Jinmu and the four most recent Emperors, after the Enthronement Ceremony and Daijosai (GreatThanksgiving Ceremony). The Emperor pays reverence at Kashikodokoro in the Imperial palace after the Enthronement Ceremony and Daijosai (GreatThanksgiving Ceremony). The Emperor pays reverence at the Koreiden and Shinden in the Imperial palace after the Enthronement Ceremony and Daijosai (GreatThanksgiving Ceremony).